Sacked Linden Town Clerk Jonellor Bowen. Linden Town Clerk, Jonellor Bowen, was today (March 23, 2017) fired with immediate effect by Minister of Communities, Ronald Bulkan, having already been cleared of any wrong-doing recently as documented in the conclusion of a recent Commission of Inquiry (COI). 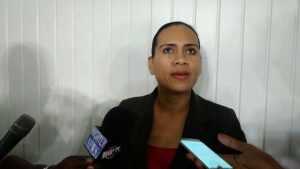 A visibly distraught Bowen, spoke with media today while at Freedom House—where she had met with and sought the assistance of Opposition Leader, Bharrat Jagdeo—and said she was at a loss as to the reason for her dismissal. Bowen was also instructed by the Communities Minister to turn over all assets and other relevant documents to the Deputy Town Clerk. She subsequently told media operatives that she was invited to participate today in a seminar at the Ministry of Communities for Town Clerks but on arrival was told to instead check with the Minister and Permanent Secretary. According to Bowen, she was informed by the Minister’s Secretary that she would need to sign to collect a correspondence, before being ushered into the Permanent Secretary by his secretary. “He (Permanent Secretary) indicated to me that what I have in my hand is a letter and he wishes me well,” at which point Bowen said, she was informed that she could no longer be a part of the seminar. The now former Town Clerk said while she is still mulling over her options, seeking legal redress has not been ruled out and that the letter did not give a reason for her appointment being revoked. According to the letter seen by Demerara Waves, Minister Bulkan only cited the section of the legislation authorizing the action with regards the Town Clerk’s appointment. She said, “at this point I will ask for advice on the way forward…” Pressed further on her thoughts regarding the sudden dismissal, Bowen maintains that she was cleared of any wrong doing by the COI and was reinstated on March 1. She did report there had been several verbally abusive conflagrations allegedly triggered by Linden Mayor Carwyn Holland. Bowen told media operatives during a recent meeting she had with Holland, an administrative matter was raised and she offered her advice according to her remit “but he started raising his voice at me,” using condescending language before chasing her out of his office. This, she said, is a matter that has been raised at the level of the Ministry of Communities and she would have advised that it be dealt with by the Administrative Committee of the Council but this is yet to bear fruit. According to Bowen, the written complaints against Mayor Holland speak directly to his treatment of the female department heads at the Municipality. Bowen who served as the Linden Town Clerk from July 2012 said she is still contemplating her future actions which would be guided by advice but has not ruled out court action.